M Medina-Nieto (2018): “Critical analysis of Spain’s television content production and national public radio and television law. The case of TVE”. Revista Latina de Comunicación Social, 73, pp. 730 to 747. Introduction. This article presents a critical and quantitative analysis of the tendency towards the outsourcing of content production in TVE, Spain’s public television network, which is regulated by law and is conditioned by its public service mission. Methods. The study is based on the analysis of the legal framework and a sample of the programming and production companies of the four channels of the public television network. Results and discussion. There is a tendency towards the outsourcing of content production in the four analysed channels which breaks the law in some cases. There are high levels of international contents in TVE, which clashes with the network’s public service mission to reinforce the national and proximity identity. Conclusion. The research findings can be helpful for future research projects aimed at the analysis of the quality of the contents and public service mission of TVE. Television; public television; Spanish television; outsourcing; public service. The existence of television production companies in Spain dates back to the beginning of the regular broadcasts of Spanish Television (TVE) in 1956. However, the multiplication of these production companies started in the 1980s, when regional channels first emerged in the autonomous communities of Spain, quickly followed by the emergence of private channels. The approval of the Third Channel and Private Television Laws (1983 and 1988, respectively) meant the end of the public monopoly and the creation of new content production companies, especially when Antena3 and Tele5 began broadcasts (Artero, 2008: 9 et seq. ; Bustamante, 2013: 135 et seq.). In this context, television networks, both public and private, “thanks to the external provision of content, saw the possibility of dealing with budgetary constraints by outsourcing a part of the resources necessary for their activity” (Fernández-Quijada, 2009: 67). Television development came with the evolution of the audiovisual sector and, more specifically, of production companies. With private networks, a “new model of competition was implanted, which radically transformed the audiovisual production system, advertising policy and programming techniques of the networks” (Bardají & Gómez, 2004: 33). Although producers tended to be seen as containers of creativity, they actually became an opportunity to lower production costs, which are outsourced in many cases, although the networks continued to maintain control of the programming spaces (Fernández-Quijada, 2009: 67). In this sense, TVE workers have complained about the tendency to outsource production and neglect in-house productions (made 100% by the network). This has caused staff layoffs and the diversion of funds to hire private production companies. Precisely, the 2006 Public Radio and Television Law (17/2006, of 5 June) , established a minimum rate of domestic production for all channels in the public multiplex network — with differences between general-interest and thematic channels —, in such a way as to guarantee the national origin of the production, the use of the network’s human and material resources and the reduction of production costs for certain formats that do not require outsourcing. The extended supply led to the emergence of a competitive television system, which had very low-quality standards, and “quickly contaminated public television with its strictly-commercial programming practices and abruptly interrupted the democratic transition of television” (Díaz Nosty, cited by Reig García, 1998: 57). In addition, private television channels in Spain increasingly look alike in terms of programming, reflecting the clear “homogenisation” of contents in the two platforms that form the duopoly (Medina, 2017). Although the tendency to outsource production to international companies is happening in the Spanish private television -specifically in the duopoly formed by Mediaset España Communicación and AtresMedia Corporation—, TVE must meet a minimum of internal production. The 2010 General Law on Audiovisual Communication (Ley 7/2010, of 31 March), established “Rules for the liberalisation” and “Deregulation of the television sector which, in the words of Zallo (2011: 308), looks like a “an invitation to concentration”, encourages concentration of strong companies and “does not guarantee the public’s right to quality communication” because it involves a “rupture with [...] the concept and practice of public service, pluralism and limits to concentration” and the “minimum obligations to guarantee the preferential social role of communication without detriment to its role in the market” (Zallo, 2011: 311). Our critical focus from the perspective of the political economy of the media allows us to approach the object of study (TVE) from a global and integrative perspective, where this media panorama is defined by the power relations in the capitalist context. The outsourcing of production, parallel to the process of concentration, cannot be understood without attending the interrelation between political, economic, business and media factors (Albert, 2014:168-169; McChesney, 2002: 243). Following Ramón Zallo (2011: 149), the communication system “has reached such a magnitude that it has become a very powerful sector, globalised and linked to the financial sector”. From this holistic perspective, we will apply our approach to a national and specific case: outsourced content in TVE, in its two general-interest channels and two thematic channels, through audiovisual production companies, their connection with international capital and their presence in the country’s most-watched public television networks, while examining its public service function. Our task is not to analyse qualitatively the quality of the contents of public television in Spain, but to demonstrate that there is a high degree of outsourcing of programmes in general across all TVE channels, both general-interest and thematic, which corresponds to the logics of commercialisation and internationalisation of the capital of the production companies. Analyse the legal framework of content production of TVE to confirm the extent to what it is breaching the law. 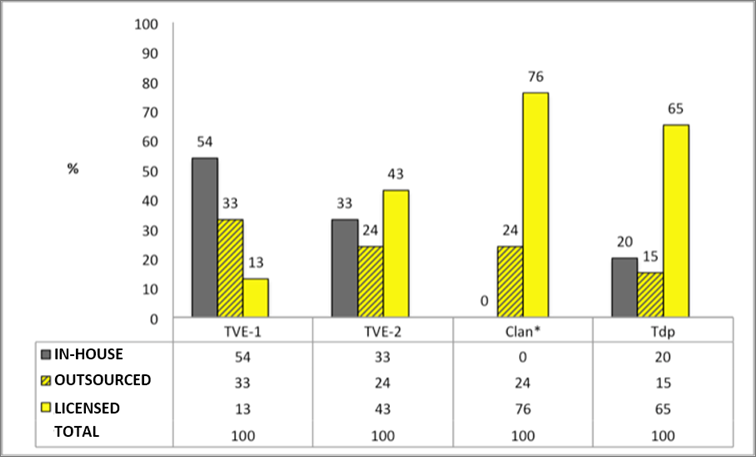 Analyse the programming of TVE’s four free-to-air channels —two general-interest and two thematic channels— to estimate TVE’s in-house production percentages (TVE-1, TVE-2, Teledeporte and Clan) and quantitatively determine whether it meets the minimum levels established by the Law 17/2006, of 5 of June. After identifying the outsourced content, identify the nationality of the content providers of TVE’s four public channels, and determine the origin of the capital of providers to demonstrate the strong tendency to the internationalisation of contents. Is there a legal regulation for the production of the public network? What is the regulation in terms of production? What is the quota established in the law for in-house programming in the two general-interest public channels in Spain: TVE-1 and TVE-2? and for the two thematic channels: Clan and Teledeporte? Do they meet these minimum own-production quotas established in the law for a specific sample in the four channels? Do international (foreign) capital predominates against national production in the selected channels, based on the production companies that intervened in the creation of contents? To understand the structural interrelation between the political, juridical, media-economic and cultural aspects of the analysis of the case that concerns us, we will refer to these factors through a historical review of the Spanish media context. Public networks in Spain, specifically TVE, are the only ones that compete, in terms of audience, with the private duopoly. In fact, “Public television, in a competitive and open system, [...] must be the counterweight against the great process of concentration that determines the new convergence between the financial sectors, telecommunications and mass media” (Moragas & Prado, 2001). However, the 2010 General Law on Audiovisual Communication led to this business concentration, reduced the public service function of radio and television to public-owned media and further liberalised advertising in television (Zallo, 2013: 149). Born in 1956, Spanish public television had to wait for Franco’s death to receive a legal framework through the 1981 statute. For years, it was the only television network in Spain given that the private audiovisual sector did not emerge until the early 1990s. The coming into effect of the autonomous regions system, just after the democratic transition, allowed the arrival of some other regional entities (Bustamante, 2013: 127-133). Thus, until the late 1980s, Spain only had the Public Radio Television network (RTVE) and the regional television channels of Galicia, Andalusia, the Basque Country and Catalonia. As some authors say, a paleo-television system dominated this time, in opposition to the neo-television that emerged with the liberalisation of the market and the consequent emergence of new channels (Vázquez Barrio, 2011: 68). In the case of RTVE, the political instrumentalisation began at this time and continued in the years to come. If we consider the general directors of TVE since 1982, we will realise that during “the administrations of the PSOE and the PP, this post was occupied by militants of those parties” or like-minded people (Labio Bernal, 2006: 143). The arrival of private television in 1989 changed the role of RTVE, which began a strong process of commercialisation while it was still used as a political tool at the service of power. In fact, the status of RTVE (Law 4/1980, of 10 January), a basic law already repealed since 2002, established a model of management and control for RTVE through three levels: General Director — proposed by the Government —, Board of Directors — proposed by parliamentary groups – ­ and the Parliamentarian Control Committee (Zallo, 2011: 328). This model was characterised by its politicisation and the decision capacity of the Directorate-General. The appointment of the then Director General of the entity by the executive produced an ideological intoxication that twisted more and more its role as public service television (Labio Bernal, 2006: 141). Enrique Bustamante (2002:232 et seq.) argues that since the transition, governments have politically used RTVE and deepened its bankruptcy. With this, two decades later (in the 2000s) and with well-established private television channels, the arguments were repeated, but now in favour of the desirability of legitimising some public communication services —against oligopolies — to guarantee plurality, within the framework of public spaces for social cohesion and democratic participation (Moraga & Prado, 2001). Around 2005, RTVE was a heavily indebted entity and deeply subjected to the serious criticisms that faced the government and the opposition. In 2003, the national audience condemned TVE for the violation of the fundamental rights of strike and freedom of association, following a lawsuit filed by the trade union known as Comisiones Obreras based on the informative treatment of television news programmes during the general strike of June 20, 2002 . This issue led people to question TVE’s role and to the consideration of a reform to end the partisan use of the entity during the presidency of José Luis Rodríguez Zapatero. This attempt to equip TVE with a new legal framework came with the Statute of 2007, with a previous step in the Employment Regulation Dossier agreed with workers. Between this year and 2012, TVE lived a time of good audience and recognition, even international, as it received awards and distinctions, especially for its informative work. From 2012, the Conservative government of Mariano Rajoy began a new stage in the political use of the corporation, which reached its most conflictive period between 2016 and 2017. The continuing allegations of the Media Council about manipulation joined the workers’ demands on the need for more in-house productions. In fact, in the summer of 2012 the Internal Production Table was established in TVE to “ensure transparency in hiring and the use of the company’s own resources when producing content” . At present, however, unions continue to denounce the high presence of external companies in the production of programmes, a central issue that we will try to demonstrate in the empirical analysis of this article. We understand that the media system in general has the function of helping to shape our image of the world through truthful and plural information. Therefore, the role of public media is fundamental because while “private media have public responsibilities that are more or less demanding, they are not democratic spaces but, for the most part, are private properties that seek to grow”. The oligopolistic situation in the media sector and the commercialisation of their offer distorts the meaning of these functions, and complicates the work of journalists, determined to guarantee quality information and not to subordinate professional deontology to market logics (Zallo, 2013: 149). The political use of TVE and its submission to economistic issues pose a danger to its role as a public service, as well as a risk for pluralism and democracy. Precisely, there are control mechanisms to oversee its function as a public operator, such as the Board of Directors and the social representation of the advisory bodies, as well as parliamentary scrutiny. However, in recent times, TVE has lacked clear public service objectives, a funding model and a structure that allows its democratic management and control. An eminently commercial programming devoid of any sign of public service identity has been promoted (Bustamante, 2002: 232; Zallo, 2011: 327). 1.4. The regulatory legal framework. A counterweight against outsourcing? To achieve the first objective, this section analyses the legal framework of TVE. Article 2 of the 2006 Public Radio and Television Law (17/2006, of 5 June) establishes that the public service of state-owned radio and television is an “essential service for the community and the cohesion of democratic societies” that aims to “disseminate their cultural identity and diversity; promote the information society; promote pluralism, participation and other constitutional values, guarantee access of significant social and political groups”. Licensed content: That on which the RTVE Corporation only has broadcast and dissemination rights, but no involvement, with own resources, in any of the production phases. Licenced content will always be considered external production and may involve patrimonial exploitation rights. Mixed production or co-production : That in which the RTVE Corporation participates with a contractually delimited percentage, either in production, exploitation of rights or both. Own production: That in which the RTVE Corporation owns 100% of the exploitation rights. Own production can be internal or external production. Internal production: That in which the RTVE Corporation can be imputed for the consumption or allocation of any own resources, either in whole or in part of an audiovisual production. External production: That whose production has been allocated resources of the Corporation, limiting its participation to exploitation of rights. This classification of article 34, which has been criticised by workers of the public entity due to its lack of definition, will be taken into account for the analysis, but not the denomination or nomenclature used by the aforementioned law in its article 34.a.2 and 34.a.3, because the vagueness itself prevents the analysis of the sample. Instead, we will consider the proposal made by Enrique Bustamante (1999: 108), which has been recently followed by David Fernández-Quijada (2013; 2009) and will be described below. This proposal combines the sections a) and b) of article 34 of the law and provides sufficient criteria to be able to carry out an analysis of a given sample, which is the central objective of this article. Article 34.b. considers as external productions only those programmes that “have not been allocated resources of the corporation”, which would imply counting as internal productions all those programmes where TVE collaborates minimally (because it can “impute any own resource”), such as for example, with the mere provision of a set. But in fact, this type of product should not be considered as internal production, since it is carried out by an external company in its entirety. To classify the spaces that the Framework-Mandate defines as “mixed production or co-production” we need to know what percentage of resources corresponds to the network and which to the production company. However, this information is neither published nor provided by the management of the entity, as the workers have denounced. In addition, the measure system (art. 36 of the Framework-Mandate) and the definition of “own production” is confusing in the different articles of the mandate. In fact, in 2009 the union section of RTVE proposed the modification, without success, of these articles for the previous reasons. The lack of transparency is notorious. The Internal Production Commission and an audit carried out by the General Intervention of the State Administration have warned that the minimum quotas internal production set in the Framework-Mandate are not being met . In fact, a government-dependent body, the National Commission of Markets and Competition, —which produces annual reports for the RTVE Corporation—, in its 2016 report on the fulfilment of the public service mission, warned ab out irregularities in many aspects of the corporation due, precisely, to the reluctance of the management of the entity to facilitate reports and contracts, and detected obstacles to verify data on political pluralism and compliance with the internal production quota . All of this prevents us from being able to verify whether TVE is obeying the law 100%. Still, we can analyse the presence of external production companies and determine their involvement in the network, as well as their origin or nationality, to get a panorama of the configuration on the origin of the contents broadcast by the entity. 60% of internal production in the general-interest programming offer. 20% in the case of the thematic offer. On the other hand, article 35.2 also refers to the quantity of production in relation to the programmatic genres or formats. However, we will not check this very detailed situation, taking into account only the percentage according to the origin of the production: internal or external. The study adopts a quantitative approach because the objectives that we want to achieve require a percentage analysis of the programmatic contents of the four networks. Our work uses a random sampling method based on the “constructed week” (Stempel, 1989). This method allows us to obtain more reliable results for media studies, since it avoids concentrating in a week possible repetitions of subjects or contents in a given context. In this way, the selection de the sample comprises the first quarter of 2017 (16 January to 5 March), beginning on the second half of January, when television channels resume normal programming after Christmas. Thus, the selected sample is: Monday, 16 January 2017; Tuesday, 24 January; Wednesday, 1 February; Thursday, 9 February; Friday, 17 February; Saturday, 25 February; and Sunday, 5 March. The content analysis of the production companies of the channels belonging to the multiplex of Spanish Television: TVE1, TVE2, Clan and Tdp, will allow us to measure the degree of outsourcing —production of formats by companies external to the network— and the nationality of the companies that produce such content. The analysis first involved the creation of a database for each analysed network, including name of each programme, duration, name and nationality of the production company/companies, to obtain the levels of content internationalisation. Then, the programmes were classified in percentage points (based on their duration in minutes) in in-house and external productions. The latter is divided into outsourced and licenced content. This process is performed on each of the channels. The results are treated in percentages according to the duration of the programmes. 1. Internal production: Any production in which the television network participates in a total or partial way. 1.1. In-house productions: completely produced by the operator with its own material and human resources. 1.2. Outsourced content: Produced by the television network with other independent production companies. The network has ownership rights over the products and can broadcast them whenever it wants, as well as and commercialise them with other networks. 2. Licensed content : The network does not participate in the production and simply buys its rights in the programme market. We talk about external production we refer to content classified as outsourced and licenced content, since any of these categories always involves one or more audiovisual production companies. On the contrary, in-house production is not outsourced and is produced by the network with its own resources. As explained, it is not possible to rely entirely on the Framework-Mandate (first objective and first research question) to verify compliance with the law. It is necessary to use another classification of content as a methodological proposal. In addition, article 36 on the measurement criteria neither allows us to do so, because the Corporation establishes the “evaluation system capable of measuring the allocation of own resources”, which we do not known and because “the computations to measure the percentages of internal and external production will be determined based on the total of broadcast hours/year of emission of the whole of the radio and television channels”. Having answered the first research question and achieved the first objective, this section analyses, based on the selected sample, the level of outsourcing (second objective and second research question) whether TVE meets the minimum quotas. The trend towards internationalisation and the penetration of foreign capital on Spanish public television is analysed afterwards (third objective and third research question). This section presents the results about the tendency to outsource content for each of the public channels, based on the data collected in the database (see Figure 1), according to the selected method. General-interest channels present a higher percentage of in-house production of content because the law requires so (a minimum of 60%), while the thematic channels are only required to meet a 20% quota of this type of production. 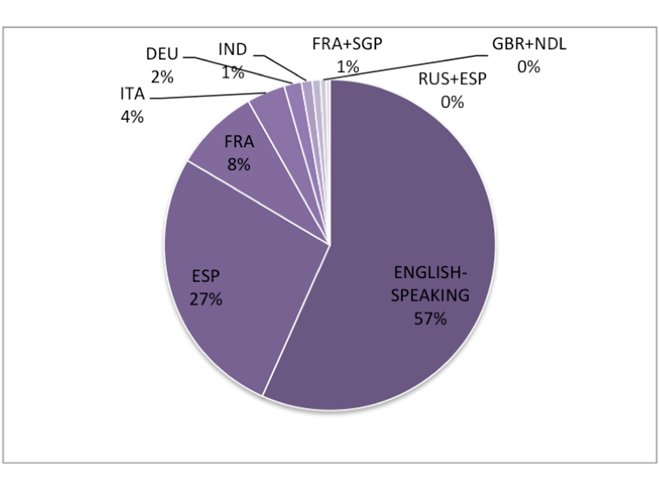 As shown in Figure 1 in grey, in total, the in-house production of TVE1 accounts for 54% of the broadcast time, during the period of analysis. It is the only channel in the sample with more internal production than external production (54% vs. 46%). 33% of its production is outsourced, i.e., TVE-1 collaborates in some way in its production, even if minimally, and 13% is contents purchased ready to be broadcast (licensed content); and together these two types of production represent almost half, 46%, of the production. Being the most important public network in Spain —in terms of audience— it tends to outsource production, limiting in-house production to information programmes (newscasts and magazines). Info-entertainment programmes dealing with current affairs and reality television are always produced in collaboration with private production companies (outsourced production). With regards to the proportion of production, we must clarify that all informative and institutional programmes that TVE-1 classifies as in-house production, have been considered 100%, despite the fact that trade unions and workers have denounced partial outsourcing on some occasions , which would mean breaching of the Framework-Mandate in its article 35.2.. However, these contracts are not public, so it is not possible to know whether they are produced and in what proportion. Anyways, these irregularities that suppose the breach of the law, apart from being impossible to detect from outside the entity, suppose, according to the complaints of unions, few percentage points. The configuration of the second general-interest network, TVE-2, differs from the first channel. It only produces 33% of the contents with its resources, so the level of external content is important (67%) and greater than TVE-1 (Figure 1). In this case we can talk about a breach of the law (although only in the period analysed) for the following reason: The percentage of “licensed content” (art. 34.a) is clearly established in the Framework-Mandate and we have registered in the database under the same name. Article 34.a clearly states that licensed content will always be considered external production, so if we have obtained 43% of licensed content, this means that the level of external content in TVE-2 is 43% of licensed production, plus the “outsourced production”. According to the law, external production in TVE-2 cannot be greater than 40% (because 60% must be in-house production), so indisputably TVE-2 breaches the mandate during the period analysed. This is not the first time the violation of the audiovisual law is investigated. Recently, Ruíz Acín and Bandrés Goldáraz (2017) showed the breaching of article 4 of the 2010 General Law on Audiovisual Communication for the specific case of an entertainment programme of the private channel Telecinco (Mediaset España). The high proportion of licensed content in TVE-2 is due to the nature of the network, which broadcast programming devoted widely to the genres of reportage, documentary and educational programmes whose production requires substantial resources. This leads to the purchase of programmes from, mainly, foreign, particularly Anglo-Saxon, production companies (Figure 3). 43% of all production is of this type, a high percentage, ten points higher than the in-house production. This fact makes us think about the origin and quality of the content in this public television channel. In fact, the analysis of the data shows many of the programmes emitted by the network and included in the sample are produced, paradoxically, by the BBC, as we will analyse below. Clan is a thematic channel dedicated exclusively to children. Figure 1 shows that almost 100% of its contents are external (99.8%). Of the four channels, it is the one that resorts the most to foreign companies for content production. Of the total production, three fourths are licensed content (76%) and only one fourth is outsourced production (24%). The percentage of outsourced production, 24%, is achieved thanks to two programmes: Cuéntame cómo pasó (“Tell me how it happened”), a long-lasting fictional series that used to be broadcast on primetime in TVE-1 and is not even meant for children, and Yoko, a children’s series created by three Russian production companies in collaboration with TVE. Cuéntame cómo pasó manages to reduce the high percentage of licensed content (since this series is produced by Spanish production company Ganga in collaboration with TVE, so it is counted as outsourced production) and increases the percentage of internal production, which is close to the quota set in the Framework-Mandate. Being a thematic channel, it is only required to meet a minimum of 20% of internal production —and 80% of external production (art. 35.3)—. Therefore, we cannot confirm that it breaches the law, since we do not know how much of the 24% we classified as “outsourced production” corresponds to internal production and how much to external production, according to the law. We can only point out that at least 76% of total is licensed content, but the law allows up to 80%. In any case, we can talk about a negligible percentage of in-house production (0.2%), which corresponds only to one programme, Los Lunnis, which was aired on one weekend during few minutes, hence the scarce representation of in-house production. As Tamara Vázquez has pointed out (2009), in-house production is one of the most important aspects to take into account in the analysis of the quality of children’s contents, which is negligible in this case. Most of the programming broadcast corresponds to licensed content. Teledeporte (Tdp) is the other thematic channel dedicated exclusively to sports. The analysis confirms that Tdp’s production distribution complies with the law, which only requires 20% of “internal production” (art. 35.3) and the sample contained 20% of in-house production, so the percentage of “domestic production” would be even greater than 20% (Figure 1). This way, this channel exceeds the minimum demanded. External production, which is 80%, corresponds almost entirely to licensed contents. According to the Framework-Mandate, the channel can outsource up to 80%. The large proportion of licensed products (65%) compared to outsourced products (15%) is because being a sports channel, it requires purchasing of broadcasting rights for matches and competitions. The sufficient in-house production of Tdp is due to informative programmes —such as Estudio Estadio and Conexión Tdp— which are produced 100% with the network’s own resources. After having established the low levels of in-house productions (made 100% with TVE’s own resources) of the four channels, we will examine the external contents, i.e., the programmes in which an external production company intervenes. This involves the analysis of 46% of the programming TVE-1, 67% of TVE-2, 99.8% of Clan and 80% of Tdp. This means that, in average, 73.25% of the programmes broadcast by the public network are external productions. In general, we can point out that the four channels present a strong degree of internationalisation based on Anglo-Saxon products (American and British, in their majority), which in some cases exceeds the production of Spanish origin. In TVE-2, Spanish capital accounts for only one third, which is less representative than in TVE-1. However, in TVE-2 European capital is much more significant, with 38% approximately, than the American capital (Figure 3). 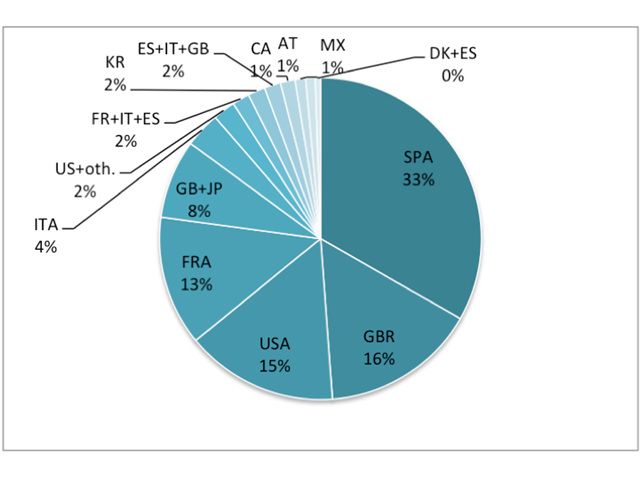 However, TVE-2 has 31% of Anglo-Saxon content in total, which almost equates the national origin of contents (33%). Based on these data, we can say that in TVE-2 the share of programmes produced by foreign European companies (38%) is larger than that produced by Anglo-Saxon and national companies (31% and 33%, respectively), which is an important issue as it is a public channel, which is presupposed to broadcast contents that reinforcement of identity and promote proximity as part of its public service mission. Yet, the international origin of content is very noteworthy compared to the national, since it represents 67% of all external production. The Anglo-Saxon origin of the contents is supported in large part by the BBC’s public production company. * The “English-speaking” category combines production companies of Anglo-Saxon capital since there are many co-productions between English-speaking countries and the percentage would be illegible. Clan is TVE’s thematic children’s channel. In this case, external production is very extreme; 99.8% of the production is carried out by private production companies and of that percentage, 76% is 100% carried out by private production companies without TVE intervention (Figure 4). This shows that the contents aimed at children (not teenagers) are mostly (three-quarters) produced by private companies. 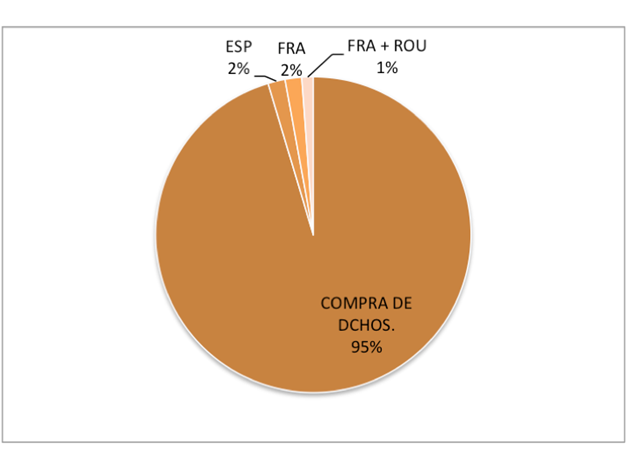 Moreover, those external contents are also mostly produced by foreign companies , mainly Anglo-Saxon (57%), while only 27% is produced by Spanish companies (Figure 4). Anglo-Saxon contents were further classified to clarify the origin, since there are many collaborations between Anglo-Saxon production companies, which prevents us from analysing the data clearly. The disaggregation of the 57% of Anglo-Saxon productions would be as follows: American 22%, American-Canadian 12%, British-Canadian 5%, Irish-American 5%, British 5%, British-Irish 4% and Canadian 3%. Other studies on the quality of children’s television content in Spain support the data collected in the sample and how the outsourcing of contents influences the quality and origin of children’s channels (D’Arma & Labio, 2017). 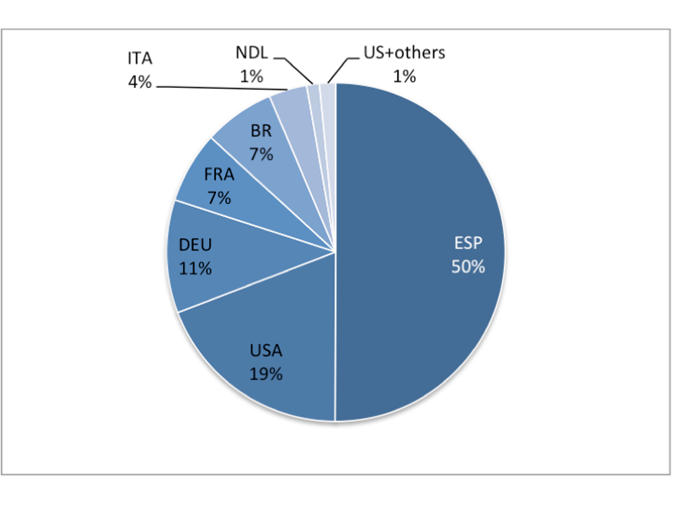 As Figure 5 shows, contents are not created in their majority by one audiovisual production company but are the result of the purchase of broadcasting rights by the public network. However, the contents have a French and Franco-Romanian origin and are sports documentary programmes with little representation. However, the outsourcing of contents in this channel, as mentioned, does not infringe the limits set by the law and therefore guarantees the national origin of the in-house production. The analysis of the legal framework shows that the law regulating the production of contents of Spanish public television (the Framework-Mandate for the RTVE Corporation) is configured in a way that it is not possible to check its compliance from the outside. Quantifying the level of outsourcing according to the legislation is not possible, which prevents us from checking its full compliance. Articles 34, 35 and 36 of the Framework-Mandate are drafted in a way that the measuring criteria are not detailed. In addition, the parameters set by the law must be measured taking into account the total of hours/year. Due to this obvious lack of transparency in the law, we can only say that based on the analysis of the selected sample, and during the period analysed, TVE breaches the law on production for the general-interest channel TVE-2 and complies with the law in the case of the thematic channel Teledeporte. This indicates that we cannot prove it in all cases and only for two of the four channels (TVE-2 and Tdp). The sample reflects the scarce in-house production of the network, which stands at an average of only 26.75% for the four channels, which clashes with the budgets of quality and publicly-owned television. In-house production is one of the aspects that influences the quality of the audiovisual products. Consequently, the levels of production outsourcing of the public entity are high across all its channels. The analysis confirms the marked tendency to outsourcing, which leads to the predominance of contents that are produced by private and international companies and increases the possibilities of penetration of non-proximity content. The corporation fails to ensure the provision of content that strengthens the country’s identity, which is one of the general public service objectives (articles 7-9 of the Framework-Mandate). 4.1. The data indicate that there is a relationship between outsourcing and the entry of international production companies. The analysis has confirmed that the higher the proportion of external content, the higher the presence of outsourced production companies and vice versa (Figures 1, 2, 3, 4 and 5). 4.2. This entry of private production companies is usually linked to certain countries, especially the USA, that dominate the international audiovisual market because the most prosperous companies at the global level have an international capital. 4.3. This internationalisation collides with TVE’s legal mission of reinforcing the country’s national identity. On average, only 28% or less than one third of the outsourced content is produced by Spanish production companies, which makes us reflect on the diversion of Spanish capital towards foreign companies. 5. In this sense, our future research should qualitatively analyse the contents of TVE to highlight the values transmitted and assess the fulfilment of its public service mission based on the research results. * Thanks to Professor Aurora Labio Bernal (DEMOC-Media Research Group, Department of Journalism II, University of Seville) for her contributions and recommendations on this article, as well as for the final review. Mixed production or co-production, which the Framework-Mandate defines in its article 34.a, is classified as “outsourced production”, following Bustamante, 1999. For further details on this topic, see A D’Arma & A Labio (2017). M Albert (2014): Critique Influence Change Realizing Hope: Life Beyond Capitalism. London: Zed Books. JP Artero Muñoz (2008): El mercado de la televisión en España: Oligopolio. Barcelona: Ediciones Deusto. J Bardají Hernando & S Gómez Amigo (2004): La gestión de la creatividad en televisión: el caso de Globo Media. Pamplona: EUNSA. E Bustamante (2002): Comunicación y cultura en la era digital. Barcelona: Gedisa. E Bustamante (2013): Historia de la radio y la televisión en España: una asignatura pendiente de la democracia. Barcelona: Gedisa. A Labio Bernal (2006): Comunicación, periodismo y control informativo: Estados Unidos, Europa y España. Barcelona: Antrhropos. R McChesney (2002): “Economía Política de los medios y las industrias de la información en un mundo globalizado”. In J. Vidal-Beneyto (ed. ), La ventana global. Madrid: Taurus. R Reig García (1998): Medios de comunicación y poder en España. Barcelona: Paidós. G Stempel (1989): Content Analysis. Research Methods in Mass Communications. In G. H. Stempel y B. H. Westley (Eds.). New Jersey: Prentice Hall. T Vázquez Barrio (2009): "Evaluación de la calidad de la programación infantil de las televisiones generalistas españolas". Revista Latina de Comunicación Social, 64, p. 84—861. T Vázquez Barrio. (2011). ¿Qué ven los niños en la televisión?, Madrid: Universitas. R Zallo (2011): Estructuras de la comunicación y de la cultura: Políticas para la era digital. Madrid: Gedisa. Article received on 10 January 2018. Accepted on 12 April. Published on 17 April 2018.